Jewelry Sales Associate is an expert who helps the customers in buying suitable jewelry. 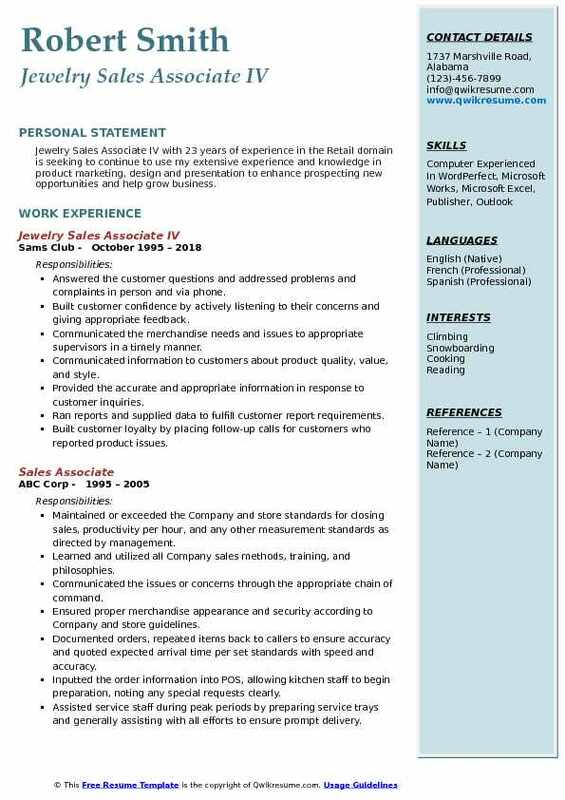 An Jewelry Sales Associate working in jewelry showrooms execute the following job tasks – identifying the needs and preference of the customer, approaching potential customers, giving advice on jewelry buying, assisting hesitant or confused customers in taking decisions, preventing thefts, arranging jewelry for display, reporting to upper management, and helping customers by packing, billing and closing sales. The ideal candidate should have an attentive nature and good observation spirit, they should be persuasive and sales-oriented and should be able to show a deep knowledge of various gemstones and precious stones, these consultants should also employ their customer-service skills and be willing to work till late hours. 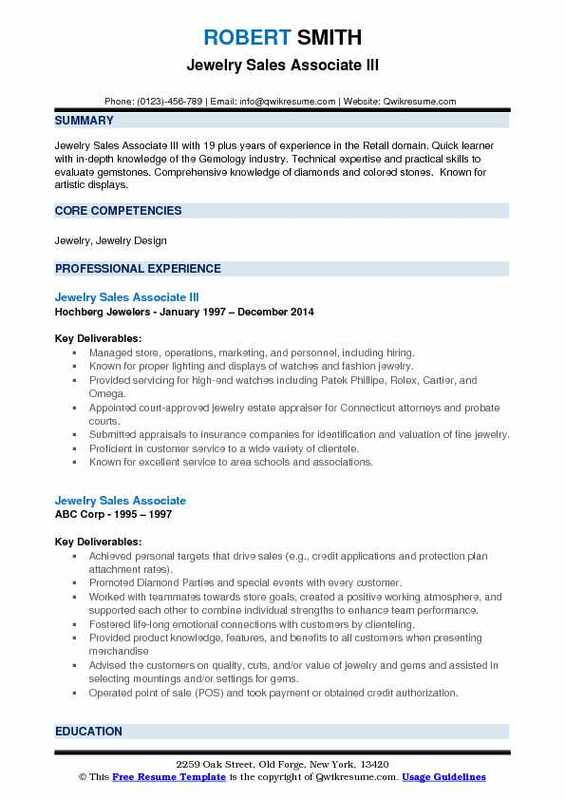 No formal education is needed for this job, but most of the eligible Jewelry Sales Associate Resume mention at least a high school diploma. 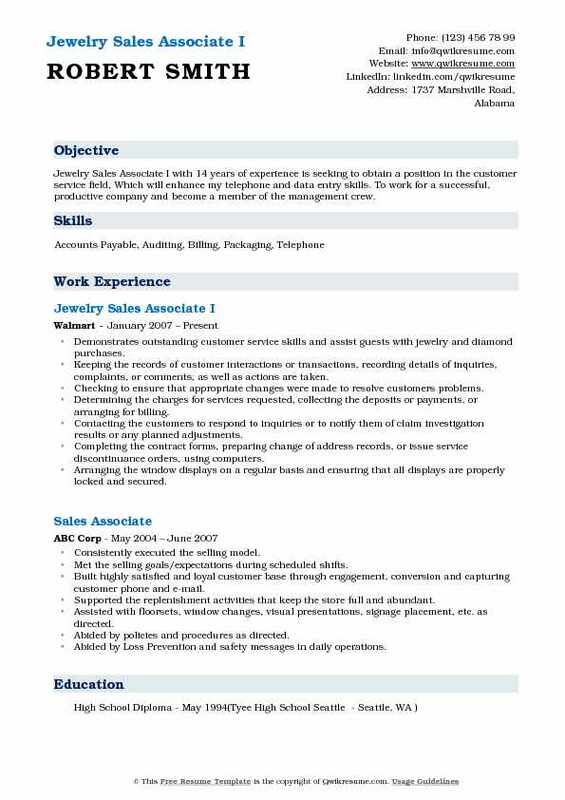 Objective : Jewelry Sales Associate with less than 2 years of experience in the Retail domain is seeking a position in Customer Service/Office Management, while incorporating my exceptional interpersonal and organizational skills, executing a wide variety of administrative duties. Greeted the customers as they arrive at the store/ counter and asked them how they would like to be assisted. Listened to customers requirements closely and provided them with information on available pieces and sets. Showed the customers their desired pieces and provided information such as setting types, stones, and cuts. Provided the customers with information on prices and any associated discounts or deals. Assisted the customers in making decisions to buy jewelry pieces or sets and suggest alternatives and complementing. Led customers through the buying process by boxing, wrapping and bagging their purchases. Provided pricing information according to weight (in cases of gold and silver jewelry) and processed cash and credit card transactions. Educated the customers about warranties and guarantees of sold pieces and ensure that all documentation is included with the bagged product. Sent out thank you notes to customers and kept them in the loop regarding new arrivals. 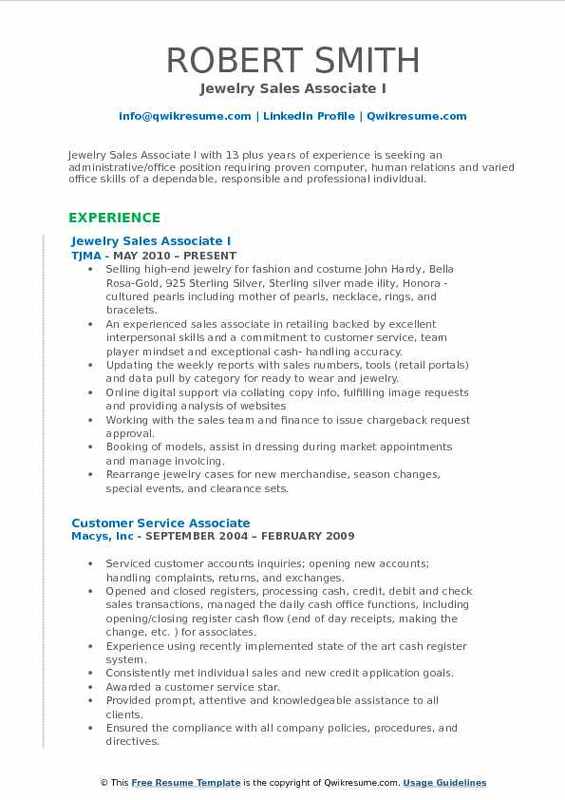 Summary : Jewelry Sales Associate III with 19 plus years of experience in the Retail domain. Quick learner with in-depth knowledge of the Gemology industry. Technical expertise and practical skills to evaluate gemstones. Comprehensive knowledge of diamonds and colored stones. Known for artistic displays. 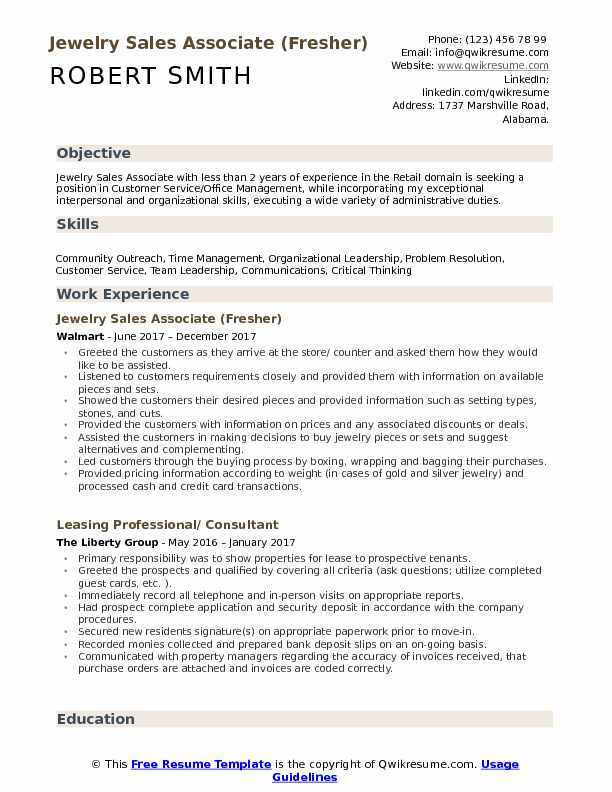 Managed store, operations, marketing, and personnel, including hiring. Known for proper lighting and displays of watches and fashion jewelry. Provided servicing for high-end watches including Patek Phillipe, Rolex, Cartier, and Omega. Appointed court-approved jewelry estate appraiser for Connecticut attorneys and probate courts. Submitted appraisals to insurance companies for identification and valuation of fine jewelry. Proficient in customer service to a wide variety of clientele. Known for excellent service to area schools and associations. Sold service awards and also corporate gifts to customers in the Fairfield County area. Service awards and corporate gifts included Omega, Accutron and Bulova watch for general electric company, Remington shavers company, Singer Sewing machine, Remington arms and other local companies in Connecticut. Displayed art carved diamond wedding rings, Lenox china and giftware at bridal shows. 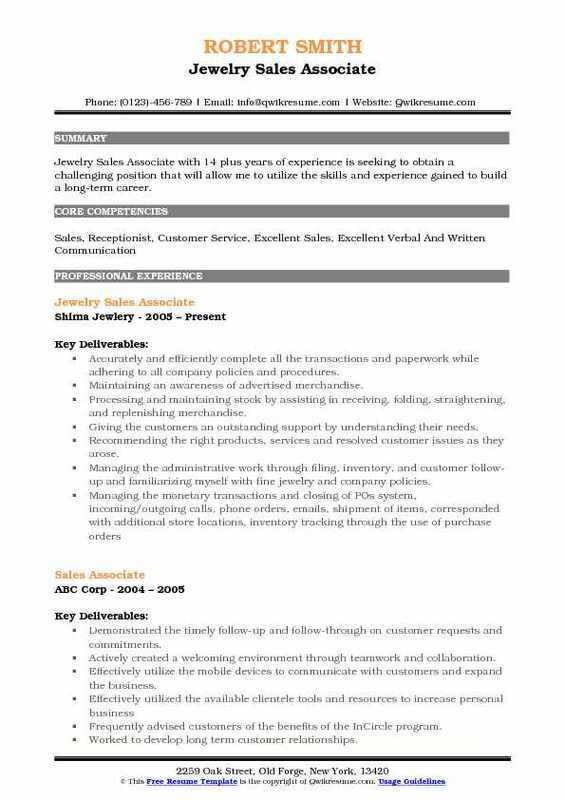 Objective : Over 3 years experience as Junior Jewelry Sales Associate with a strong background in marketing, sales, negotiation techniques, technology, social events and administrative operations. Possess capability to deal with a fast-paced and constant change environment. Self-directed, customer services-results oriented, supportive, flexible and a team player. Well organized with a track record that demonstrates self-motivation, and initiative to achieve corporate goals. 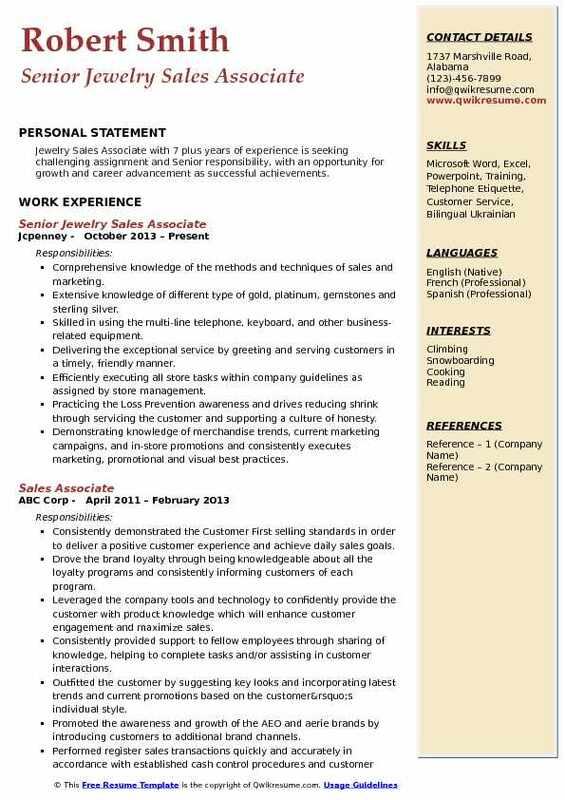 Skills : Interpersonal And Communication, Strong Oral And Written Communication In English And Spanish, Detailed Oriented, Adherence To Deadlines And Budgets, Proficient In Microsoft Office Programs, Microsoft Windows, Legal Software And Real Estate Software, Able To Type 40 Wpm. Familiarity with all types of precious stones, gold, platinum, and silver. Checked inventory and provided suggestions on stocking certain items to the store manager. Explained the cuts, carats, color, and clarity in jewelry and gems to customers. Provided an estimate on repairing luxurious watches and cut jewelry. Suggested the jewelry designs to customers suitable for certain occasions. Prepared the bills, wrapping merchandise, placing orders, and collected payment. Performed watch battery replacements and watch band adjustments. Followed the receiving and processing procedures. Displayed the merchandise and promotional materials in accordance with corporate merchandising plans. Performed the business opening and closing procedures as outlined in Policy and Procedures Guide. Summary : Jewelry Sales Associate I with 13 plus years of experience is seeking an administrative/office position requiring proven computer, human relations and varied office skills of a dependable, responsible and professional individual. Selling high-end jewelry for fashion and costume: John Hardy, Bella Rosa-Gold, 925 Sterling Silver, Sterling silver made ility, Honora - cultured pearls including mother of pearls, necklace, rings, and bracelets. An experienced sales associate in retailing backed by excellent interpersonal skills and a commitment to customer service, team player mindset and exceptional cash- handling accuracy. Updating the weekly reports with sales numbers, tools (retail portals) and data pull by category for ready to wear and jewelry. Working with the sales team and finance to issue chargeback request approval. Booking of models, assist in dressing during market appointments and manage invoicing. Rearrange jewelry cases for new merchandise, season changes, special events, and clearance sets. Summary : Jewelry Sales Associate IV with 23 years of experience in the Retail domain is seeking to continue to use my extensive experience and knowledge in product marketing, design and presentation to enhance prospecting new opportunities and help grow business. Answered the customer questions and addressed problems and complaints in person and via phone. Communicated the merchandise needs and issues to appropriate supervisors in a timely manner. Communicated information to customers about product quality, value, and style. Provided the accurate and appropriate information in response to customer inquiries. Developed strong product knowledge across all categories. Responsible for ensuring exemplary customer service by delivering the ultimate experience. Summary : Jewelry Sales Associate I with 14 years of experience is seeking to obtain a position in the customer service field, Which will enhance my telephone and data entry skills. To work for a successful, productive company and become a member of the management crew. Demonstrates outstanding customer service skills and assist guests with jewelry and diamond purchases. Keeping the records of customer interactions or transactions, recording details of inquiries, complaints, or comments, as well as actions are taken. Checking to ensure that appropriate changes were made to resolve customers problems. Determining the charges for services requested, collecting the deposits or payments, or arranging for billing. Contacting the customers to respond to inquiries or to notify them of claim investigation results or any planned adjustments. Completing the contract forms, preparing change of address records, or issue service discontinuance orders, using computers. Arranging the window displays on a regular basis and ensuring that all displays are properly locked and secured. Ascertaining that all pieces of jewelry are locked up in assigned storage palaces at the end of the day. Objective : Jr. 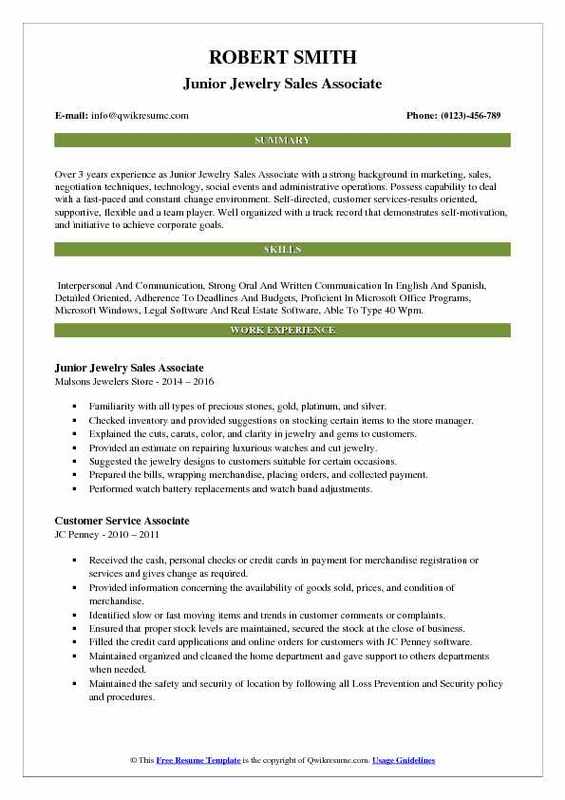 Jewelry Sales Associate with 4 plus years of experience is seeking to obtain a position that will utilize my leadership qualities, organizational skills, dedication to customer satisfaction as well as my customer service experience. Prior professional knowledge of fine metals, gemstones, and pearls remains a personal advantage in generating sales. Providing the pleasant customer experience on sales floor especially as jewelry associate. Applying the knowledge of metals/fine jewelry, semi-precious gemstones, pearls, fashion trends, designer brands, the location of production, etc. Assisting in customer’s effectively and increase sales performance. Accepting the inventory, creating visually appealing showcases for jewelry and watch items, following the corporate merchandising showcase plans when directed. Regularly assisting with store operations (closing, stock, cashier/monetary transactions, credit card applications). Creating a welcoming environment by greeting and approaching customers. Exceeding the customer expectations by providing assistance with a positive attitude. Recommending merchandise based on product knowledge and customer preferences. Summary : Jewelry Sales Associate with 14 plus years of experience is seeking to obtain a challenging position that will allow me to utilize the skills and experience gained to build a long-term career. Accurately and efficiently complete all the transactions and paperwork while adhering to all company policies and procedures. Maintaining an awareness of advertised merchandise. Processing and maintaining stock by assisting in receiving, folding, straightening, and replenishing merchandise. Giving the customers an outstanding support by understanding their needs. Recommending the right products, services and resolved customer issues as they arose. Managing the administrative work through filing, inventory, and customer follow-up and familiarizing myself with fine jewelry and company policies. Summary : Jewelry Sales Associate with 7 plus years of experience is seeking challenging assignment and Senior responsibility, with an opportunity for growth and career advancement as successful achievements. Comprehensive knowledge of the methods and techniques of sales and marketing. Extensive knowledge of different type of gold, platinum, gemstones and sterling silver. Skilled in using the multi-line telephone, keyboard, and other business-related equipment. Delivering the exceptional service by greeting and serving customers in a timely, friendly manner. Efficiently executing all store tasks within company guidelines as assigned by store management. Practicing the Loss Prevention awareness and drives reducing shrink through servicing the customer and supporting a culture of honesty. Demonstrating knowledge of merchandise trends, current marketing campaigns, and in-store promotions and consistently executes marketing, promotional and visual best practices. 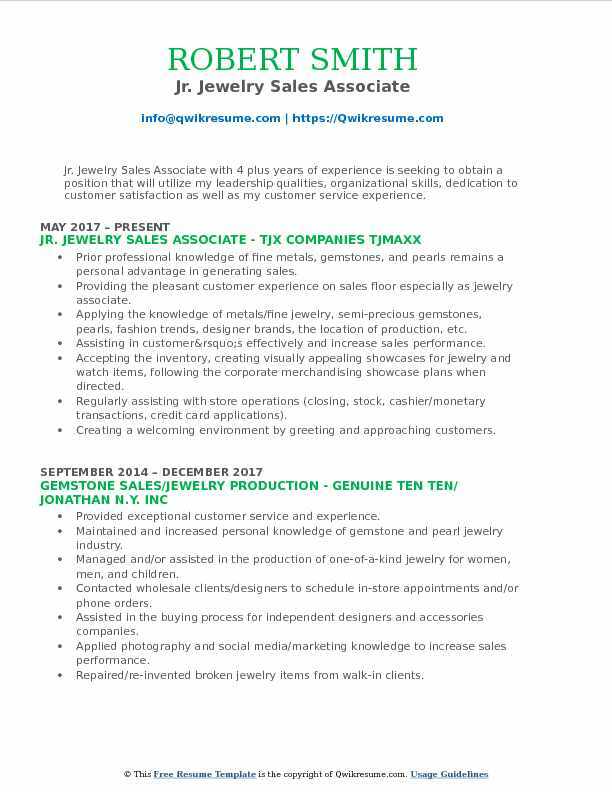 Summary : Dedicated Jewelry Sales Associate with over 27 years of experience in sales, team education, event planning, creative design, and personal/professional styling. Ability to effectively manage and facilitate all events, promotions, and objectives for a personal loan of over 15 clients, as well as manage time and schedule for both retail and event-based jobs. Advanced practical knowledge of Microsoft Office Suite, and intermediate working knowledge of Adobe software and ADP. Was responsible for jewelry product sales, responding to guest needs, providing an exceptional level of customer service to valuable customers. 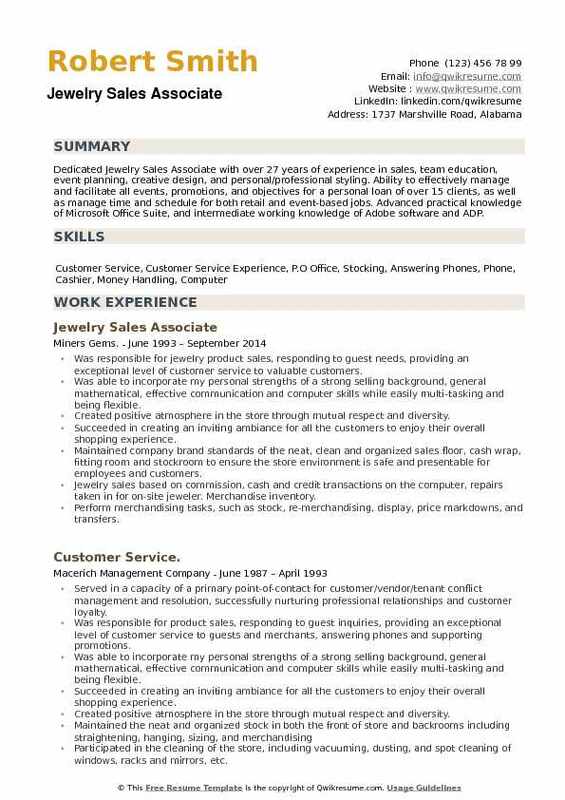 Was able to incorporate my personal strengths of a strong selling background, general mathematical, effective communication and computer skills while easily multi-tasking and being flexible. Created positive atmosphere in the store through mutual respect and diversity. Succeeded in creating an inviting ambiance for all the customers to enjoy their overall shopping experience. Maintained company brand standards of the neat, clean and organized sales floor, cash wrap, fitting room and stockroom to ensure the store environment is safe and presentable for employees and customers. Jewelry sales based on commission, cash and credit transactions on the computer, repairs taken in for on-site jeweler. Merchandise inventory. Perform merchandising tasks, such as stock, re-merchandising, display, price markdowns, and transfers. Implemented new standards of vip client protocols by sending thank you notes and congratulatory messages on special occasions.